Everything about the former Padres star pitcher, and current Reds pitcher Mat Latos. Mat Latos news with commentary, Mat Latos cards, Mat Latos memorabilia, everything about Mat Latos. I was fortunate enough to start buying Mat Latos cards back when he was with Eugene, and largely unknown. Because of this, I was able to put together a pretty nice little collection of Mat Latos baseball cards, including a bunch of autographed and game used rookie cards. Below are some of the better cards in my Latos collection. Feel free to comment on this site or find me on SportsCardForum.com as user DrewDude if you would be interested in acquiring any of these cards directly from me. Mat (Yes, spelled with just one T) Latos was born on December 9, 1987, in Alexandria. Virginia. He quickly showed an ability for baseball, and compiled impressive numbers starting as a freshman at Coconut Creek High School in Florida. By his senior season there, Mat Latos had gained a lot of attention, as his fastball was topping out in the mid to upper 90's. 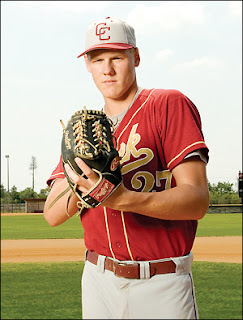 He pitched so well his senior season, he won the 2006 Sun Sentinel High School Player of the Year Award. The only problem was Latos's maturity - as there had been some incidients noted when he would chew out his teammates if they made errors behind him. Latos did still have electric stuff though, so he was drafted by the San Diego Padres as a draft-and-follow pick in the 11th Round of the 2006 MLB Draft. After going a year at Broward Community College to sharpen his stuff and learn a bit, Latos was signed by the Padres for first round type money - A $1.25 million bonus. After battling some nagging injuries in 2008 and the beginning of 2009, Latos started living up to his potential and absolutely dominating the minor leagues. Through Single and Double-A in 2009, Latos went 8-1 with a minuscule 1.37 ERA, and over a strikeout per inning. This prompted the Padres to call Mat Latos directly up to the majors from Double-A San Antonio. In his innings limited rookie campaign, Latos did show some decent potential, but fatigue and an innings count kept him from showing too much for the last place Padres. In 2010, however, Latos has shown that he is truly capable of becoming the next great Padres ace pitcher. After a rough April, Latos has bounced back to be up there with any other pitcher in baseball. So far Latos has been brilliant, so if he can keep it up, the sky is really the limit for this young flamethrower. MatLatos.com. Simple theme. Powered by Blogger.